Do you love your category pages? Does Google? Do your users? Consider this category page for low carb recipes from Diet Doctor. Not only is it well designed and super-useful, but it also outranks everything in its class. It rakes in over 600,000+ organic visits/month according to Ahrefs. There’s a crazy rumor in SEO that Google doesn’t like to rank category pages. Nothing could be further from the truth. If you search, you’ll find 100s or 1000s of examples that prove the opposite. Category pages are a contradiction. On the one hand, they are everywhere, created automatically by popular blogging and e-commerce platforms. They are persistent in navigation and heavily linked to within your site architecture. On the other hand, they are often ignored by authors, users, and search engines alike. With only a little effort, you can create category pages that actually stand out, rank, and successfully engage your audience. Below, we’ll discuss the exact techniques to create category pages that are more useful, more likely to rank, and more likely to satisfy your users. By default, a category page is merely a list of products or posts, with occasional links to subcategories. Yawn. Our users are falling asleep already. In comparison, a Hub Page acts as a central overview of a topic or category—linking to child categories and related products—while typically offering much more depth and utility. Here’s the cool part: category pages make perfect candidates for hub pages. This is because category pages already focus on a specific theme/product/topic, and are often heavily linked to by your site’s existing internal architecture. By making a few custom changes to your category pages, you can easily turn them into hub pages that serve as a more useful central authority for a topic. We’ll discuss how to do this below. You can do better. Below, we’ve identified ten common elements of successful category pages. These elements work for both e-commerce and article/news sites alike. 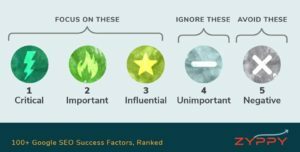 While you typically don’t need to use all 10, successful category pages typically incorporate at least 4-7 of these elements. Click here for high-res version. Feel free to use this graphic for your own use, with attribution. In the end, your goal is to make your category page simply more useful and engaging for any particular topic. As you do this, you also achieve the side benefit of making your category more attractive as a target for external links. By sprucing up your titles—and especially your title tags—you can both add topical relevance and improve the click-through rate (CTR) of your pages in search. Use the same techniques that you would use for improving any title tag while keeping your title true to the page purpose. Often, people attempt to rank categories higher by adding “SEO text.” This means a few sentences or paragraphs of closely related terms and phrases. Typically, it’s filler copy that adds no real value to the page. It’s true, adding descriptive text to a page can help it to rank, but a better approach is adding user-centric copy. User-centric copy goes beyond keywords and works to help, educate, and delight the reader. Rule of thumb for creating user-centric copy: answer the questions that users want to know when researching your topic. This means basic keyword and topic research as would be required for any other page – but sadly often gets overlooked when created category pages. Common places to research category topics include your Search Console data, People Also Ask queries, and competitor research. 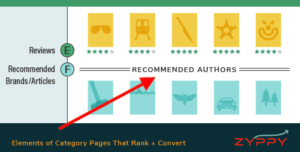 Check out Builtvisible’s excellent guide on improving category copy for more ideas. For hub pages, linking is where the magic happens. The broader your category, the more subcategories you may have to link to. Linking between these subcategories helps build the topical relevance of your content silos. Almost equally important: the opportunity to link to related categories. When sub-categories share the same parent in a silo, linking them together is part of a smart cross-linking strategy. Often, users simply want to quickly see your most popular or best-selling items. For products and posts with more competitive search volumes, a prominent direct link from a top-level category page can help these individual pages to rank higher. Amazon is particularly good at this, listing best sellers on virtually every category and search page. In addition to your most popular items, it’s helpful to link to your recommended brands, collections, or authors. Category pages are a natural location to place product reviews. They also give you an opportunity to show off merchants, or even yourself. Check out this example from Sticker Mule, which lists customer reviews under each category and subcategory type. Brilliant. When shopping, or gathering information, users often benefit from extra help in the form of guides and tools. Linking to these from your category/hub pages makes perfect sense. Additionally, when you are struggling to build links to your category pages, a well-crafted guide or tool often makes excellent linkbait. Check out this pool cleaner part guide from PoolZoom. It makes a complicated subject easy by showing you exactly what part you may need. 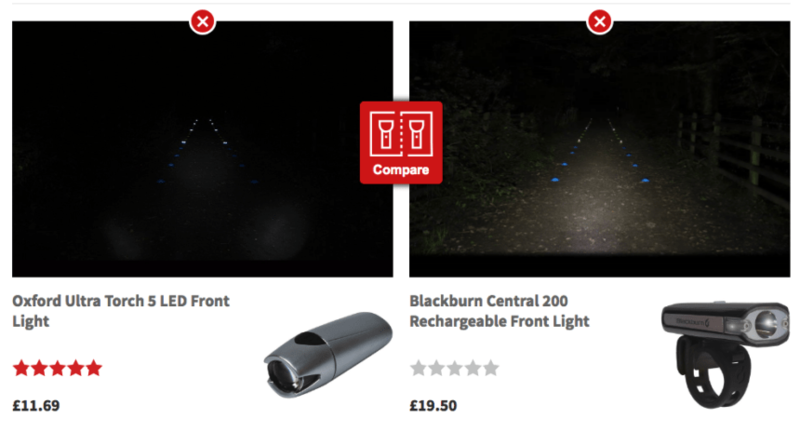 This bicycle light comparison tool from Tredz below demonstrates how well you can see with each light. While this technically isn’t a category page, it’s another idea executed brilliantly. Great category pages covering broad topics offer many ways to slice, dice, narrow and sort. The result of these sort and filter options is faceted navigation. Because each option has the potential to create an entirely new URL (depending on how you set it up) faceted navigation must be carefully managed. If a category is sufficiently broad, you may simply want to link to related subcategories and helpful resources. For example, neither these pages from L.L.Bean or REI feature long lists of products. In other situations, you’ll often find “view all” options for products and posts directly on the category page itself. Doing so can pass greater link equity to your individual product pages – helping them to rank. Or you may find that you drive more traffic/sales from your category and sub-category page, and decide to focus your link equity 100% in those locations instead. Typically the decision is made by the number of listings. If you have 1000s of products/posts in a category, it may not make sense for your user to scroll through them all. Only 100? Then it’s likely worth it to list them on the category page itself. Great content and terrific user-experience alone typically aren’t enough to shoot your category pages to the top of Google. Like any other page, you often need links. Consider this On-page SEO category page from Moz below. 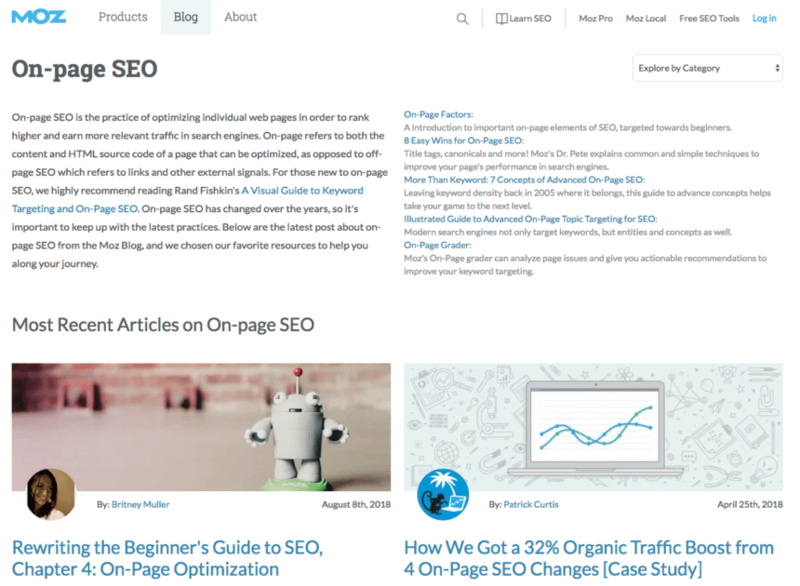 It ranks #2 for “on page SEO” and receives 1000s of organic visits per month. This is also a great example of a blog category ranking for competitive terms. You don’t need products to make a great category page. Notice how the page contains not only a list of most recent posts, but also user-centric text and links to related resources. It also has earned a ton of external links. 209 linking root domains, to be exact, according to Link Explorer. Very popular categories may be justified in your sitewide navigation. In other cases, it’s perfectly fine to link to your categories from within posts and articles – especially when it’s a helpful link. Category page link building for e-commerce sites. The good, the bad and the ugly. 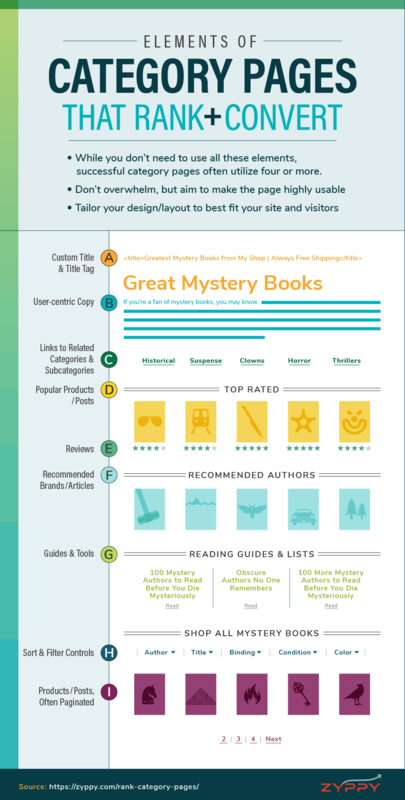 What are some of your favorite category pages and best practices? Let us know in the comments below. If I am in a WordPress Posts category hub and Mention /link to a woocommerce product category ..Won´t that “break” the silo arquitecture ? That was a really good point about user-centric copy because it’s very common when writing blogs to just stick to SEO friendly jargon and forget about the every-day reader. Extremely useful post Cyrus, I always pay attention to categories as there are many keywords that can be easily ranked with a category page. Let me tell you a curious case I’ve been working on in the last 6 months: I have a client’s site that runs ONLY on categories, literally. It has +650 URLs indexed, which are Home, 5 authors and 650 category pages. Blog posts (1000s of them) are all NoIndexed. I can’t tell much publicly, but it’s related to Coupon Codes. The result? This website is growing up fast! I’m a bit late to the game on this one, but be careful using product rating schema on category pages. I know from experience this can draw a spammy structured markup penalty. I think siloing architecture of category page is most Important for eCommerce website. Home> Category> Products> sub-Products. vertical hierarchy containing intra-horizontal links. Thanks, Cyrus for your vision. very interesting post first of all! How would they handle this un-typical scenario? how can you set the WordPress permalink in order to obtain such a nice thing? A timely post as I’m working on a site redesign and with some great insights! Hi Cyrus, great post about categories and how to use them for SEO. I enjoyed reading, because I learned a lot, but also because you confirmed my suspicions. Before reading, I was thinking about customizing my site’s categories (and tags) by adding custom text and changing article previews so its all unique content (and then removing the noindex tag); but didn’t know if it was worth the effort. well-designed category pages are a boon to SEO, because Google will want to rank them; and because most websites are stuck with template WordPress taxonomies. You mention linking to category pages from a content body. Is this so you can transfer the desired anchor text and stronger link equity? Since these are now second links on the page, Google ignores their anchors and since they are not in the content body- they have reduced value. I’m thinking about preserving link equity. I was wonder how MOZ’s category page rank for most competitive term “on page SEO” in my initial days when I started learning SEO. I’m will give it a try on my ongoing e-commerce project. Great read, Cyrus. I’ve always felt the same too. The type of category pages that WordPress (and other CMS) produce by default is rather boring, not useful to the user, and are a lost opportunity too. Many folks leave this page untouched, but clearly its highly advisable to custom modify the template with any of the types of content you have laid out above. I would urge anyone to do so too, at least to some extent. And, because it’s so heavily linked within the site architecture (as you describe), I would agree it should be considered an important task. Great point about Author Pages! Working on that myself. This site is still new so I haven’t gotten around to all these improvements, but we’re working on them. Thanks James!